These days, many people are aware that it’s beneficial to filter your drinking water. But what about the water in your shower, bathroom sink, etc? Well, it turns out that filtering ALL the water your household uses has a host of benefits! 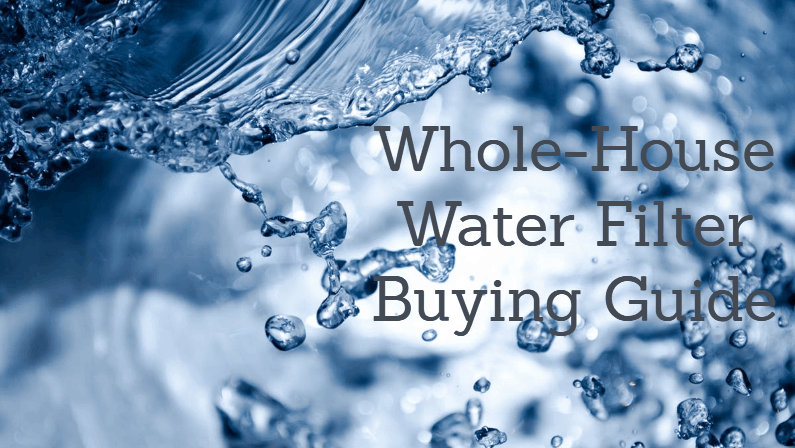 This guide will help you find the best whole house water filter for your needs. There are a lot of different options when it comes to whole house filters, so we tried to narrow it down to the best options in each category. The recommendations below were made using a combination of online research, manufacturer specs, hands-on testing and third-party whole house water filter reviews. For more info, see the how we chose section. In our opinion, the Home Master HMF2SDGC is the best whole house water filter overall. It’s effective at filtering out chlorine and other contaminants commonly found in most municipal water supplies, as well as various minerals, metals and other gunk you just don’t want to be drinking! The unit is well-priced and provides excellent value. The Home Master is designed to maximize water pressure to up to 15 gallons per minute. So, it won’t reduce your water pressure and is great for both showering and kitchen use. It’s rated to remove up to 95% of contaminants, and the filter should last up to 95,000 gallons – or about 1 year of use for a family of four. 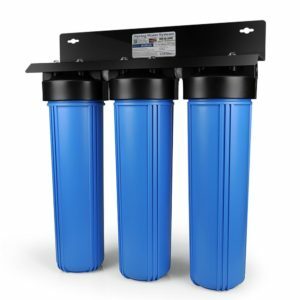 The entire system is backed by a 2-year warranty, and has earned excellent ratings in whole house water filter reviews. Keep in mind that this setup is best for tap water. If you’re on well water, see our pick for well use. If you’re ready to buy or learn more about the Home Master, click here to learn more. 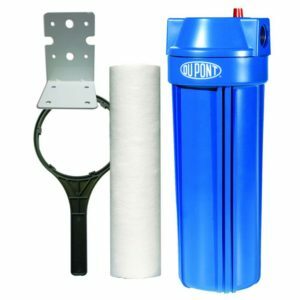 If you’re on a tight budget, this Dupont water filter may be the best whole house water filter for you. It’s incredibly affordable, but is still quite effective at filtering out some contaminants from your water. It certainly doesn’t compare with our top recommendation, but it sells for just a fraction of the price. A lot of people use these cheap filters in combination, stringing together two or three to increase the filtration power. This is relatively easy to do with basic plumbing skills, and can drastically improve their effectiveness. Surprisingly for such an affordable product, these are also backed by a 3-year limited warranty. Of course keep in mind that the filter is only designed to last for 15,000 gallons, so depending on your water usage you’ll probably need to replace the filters fairly often. With that said, replacement filters are $5-10, so it’s not a big expense! Click here to learn more. The Aquasana Rhino is a high-end whole house filter system that is built to last for 10 years, or up to 1 million gallons! The price may seem high at first glance, but considering the longevity of the filter, this setup can actually end up having a very reasonable long-term cost. Aquasana effectively removes up to 97% of chlorine and other contaminants. It’s available in a number of different configurations. You can get the standard base filter, or upgrade to a setup with a water softener and even an advanced UV filter. 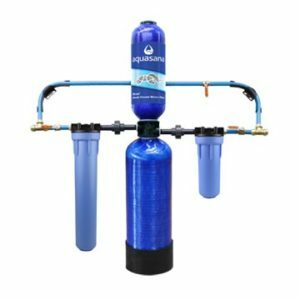 The complete package can get pricey, but its advanced technology makes it perhaps the best whole house water filtration system out there. That’s why Aquasana water filter reviews are overwhelmingly positive and praise the product. One last thing to consider is that this unit is quite large. You’ll want to check the dimensions of your installation area before purchasing this unit. Click here to purchase direct from Aquasana – and use coupon code AQWFD50 to save 50%! You can also purchase the Rhino on Amazon. For city dwellers, the iSpring WGB32B is a great choice. 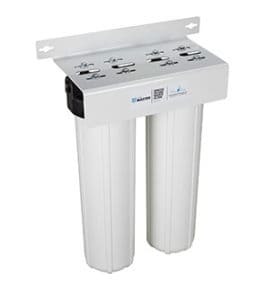 This filter effectively removes up to 95% of contaminants, including chlorine and other chemicals that are commonly found in municipal water supplies. 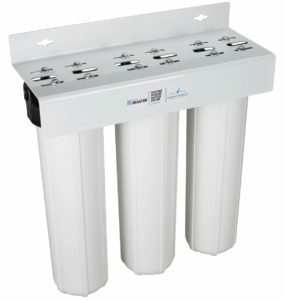 The 3-stage filter system features 2 CTO carbon filters as well as a sediment filter. These are more than sufficient for removing contaminants from city water supplies. The design also allows for a high flow rate, so you shouldn’t notice reduced water pressure. This iSpring model has consistently earned good reviews from customers, and we agree with the positive sentiment! Click here to learn more. The Home Master HMF3SDGFEC is specifically designed for well use. It’s optimized to filter out iron, manganese and other contaminants that are commonly found in wells. It’s NOT intended for city use, as it isn’t as effective for chlorine. For other well options, see our guide to whole-house well water filters. This unit can filter out up to 95% of contaminants, and it does so without reducing water pressure. It offers a flow rate of up to 15 gallons per minute. The filters are designed to last 100,000 gallons, and are cost-effective to replace. Like most Home Master products, this unit has earned excellent customer reviews. Click here to learn more. Available Space – A whole-house water system should be set up wherever water first enters your home, which is often in a basement or utility room (typically near your water heater). These things take up a LOT of space, so you’ll want to measure and make sure it will fit where you’re planning to place it. Plumbing Experience – Do you have any plumbing experience? You don’t need to be an expert, but someone with zero plumbing experience will likely struggle with an install. If you choose to go with a professional, you can expect to pay at least a few hundred bucks, depending on the setup. Water Quality – You’ll also want to think about the water quality in your area. If you have very hard water or water with a lot of sediment, using a prefilter is a good idea as this will extend the lifespan of your actual filter. Again, these are just some general tips – consult your owner’s manual for installation instructions for your specific filter setup. Taste – Filtered water is simply tastier than most unfiltered tap water! Chemical tastes like chlorine are reduced or removed, while unpleasant earthy flavors from minerals and other contaminants are also reduced. This results in a cleaner, fresher taste – which may just inspire you to drink more water! Safety – Tap water can contain all sorts of potentially harmful substances. A study found that around 1/4 of American households are drinking contaminated tap water – and often, they don’t know it’s contaminated! Heavy metals, chlorine, chemicals, pesticides and a variety of other contaminants can all cause issues, and water filters can help reduce the risk. Skin Health – Whole-house water filters in particular are beneficial for more than just drinking water. They filter all the water in your house, including what goes to your sinks and showers. By filtering out chlorine and other harsh chemicals, these units can help to improve skin health and keep your skin and hair from drying out. Appliances – The minerals found in tap and well water can start to build up in appliances such as washing machines and dishwashers. Eventually this can start to degrade the appliance. Using filtered water can help reduce this buildup and potentially extend the life of your appliances. Filtration Technology – There are a variety of filter styles, each with unique pros and cons. We researched each type and chose technologies that have been shown to be the most effective. We also made different selections for different types of water, i.e. well water vs city water, as different types of filter are more effective for some contaminants than others. Flow Rate – The best whole house water filtration system will offer a high flow rate that’s high enough to not disrupt your water pressure. Since these systems supply the whole house, maintaining pressure for a good shower is particularly important. We picked models with high flow rates that won’t significantly reduce your water pressure. Reviews – The bulk of our recommendations came from our own research and testing – but we also looked at whole house water filter reviews from other customers. This helped us get a broader perspective of each product, and get a feel for how they worked with various qualities of tap water.